Adam Levine fragrance and perfume list. 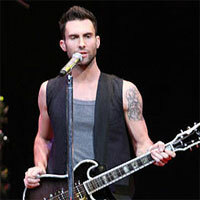 Adam Levine, an American singer and front man for pop rock band Maroon 5, was born on March 18, 1979 in Los Angeles, California. Maroon 5's debut album, Songs About Jane launched in June 2002 included hits like This Love and She Will Be Loved. Their latest album Overexposed (their 4th studio album) launched in June 2012, and included hits like Payphone and One More Night. Adam Levine is also a judge on the NBC reality TV show The Voice along with singer Christina Aguilera, CeLo Green, and country singer Blake Shelton. He launched his debut fragrance, Adam Levine for Women, produced by ID Perfumes (a division of Adrenalina, Inc. who developed Selena Gomez's perfume), in January 2013 at Macy's.